Keep that $14 million in mind as you think about the quarter over quarter comparison. That decline for the quarter was partly offset by seven new stores and higher comparable store sales (4.3%- includes e-commerce) totaling $8 million. I’ve decided that my best recent article was “How Brick and Mortar Retail Has to Change,” written last June. I was surprised it got so little feedback. Probably because the list of what customers don’t need us to do anymore is a little intimidating, and we aren’t sure how to respond. Even if, like Zumiez, your plans are responsive (as I see it) to the changing conditions, there’s still going to be a recession (not just in the U.S.), there’s too much product and manufacturing capacity, too many brands, too much retail space, too little product differentiation, and many customers have too little income. And they have to spend more of that income on necessities. I guess a cell phone is a necessity. Certainly housing, food and health care are. Back in October, there was some speculation that somebody wanted to buy Amer Sports and Amer said, “Yup, it’s true. We’re talking.” I wrote a short article about it at the time. On December 7th, they confirmed that there is, in fact, a cooperative tender offer coming beginning around December 20th. Here’s the link to the press release on the subject. At that time, a tender offer document with full information will be available. Emerald issued a press release today announcing that the Interbike show scheduled for September 2019 was a no go. Here’s the press release. I excluded the part at the end describing who Interbike and Emerald Expositions are. That’s not quite true. I want to talk about Sanuk, though probably for the last time. There’s not a mention of the once high-flying brand in the conference call, and it only comes up in the 10-Q because, inconveniently I imagine, they have to acknowledge its existence. For the quarter ended September Sanuk revenue was down 9.4% ($1.43 million) from $15.22 million in last year’s quarter to $13.80 in this year’s. The Sanuk wholesale business had an operating profit of $291,000 down from $1.23 million in last year’s quarter, a drop of 76.3%. Add any reasonable allocation of overhead, taxes, interest and the brand lost money during the quarter. It’s not my purpose to simply report earnings. That’s why you don’t see an article every time an industry public company reports. By waiting for the actual publicly filed document, I hope to glean a few pieces of information that might make you think-bring you up short even- and perhaps help you run your business better. VF has had a string of glowingly good reports and the one for the quarter ended September 30 is no exception. I’ll get to summarizing the numbers, but first here are some other things for you to consider. Back in September, VF held a Vans investor day where they announced they were planning to take Van’s revenues from $3 to $5 billion in five years. I wrote this article looking at why they might, or might not, pull it off. I said, “Vans is well into an experiment to see if a truly “omnichannel” approach to branding and customer engagement change some of the rules for growing a brand.” They are betting they can outperform by doing the things all brands/retailers need to do but doing them better than their competitors. What ever happened to “features and benefits” as the preferred way to differentiate products? A year ago, a friend recommended Retail’s Seismic Shift, by Michael Dart, to me. It finally got to the top of my reading stack. Should have gotten there sooner. In the last chapter is an interview with former VF CEO Eric Wiseman. Good read. One of the things we do in the new retail environment, and that VF thinks it can do better than most, is to be insightful about where we get sales growth. Too much growth in the wrong places, as it always has, equals brand damage. I’ve been making that speech for at least a decade, but it’s become more important as the consumer has become more knowledgeable, perhaps less brand loyal, able to find information easily and buy in multiple places. CFO Rendle suggests in the conference call that they feel Timberland has the same potential as Vans, The North Face and Williamson-Dickie to maintain its core business but expand outside it. Controlled distribution in a brand’s existing franchise to protect the brand’s credibility but look for growth in tangential areas for growth where it’s already accepted but the opportunity hasn’t really been exploited. This, I’m pretty sure, is a key criterion for VF’s evaluation of brands- both those that they buy and those that they sell. It’s not exactly a sale, but VF is spinning off their jeans business as a separate public company. Here’s what I wrote about the August announcement. On October 2, 2017 VF acquired Williamson-Dickie for $800.7 million. It generated $252.8 million of revenue and $18.5 million of new income in the September 30 quarter. On April 3, 2018, VF acquired Icebreaker for $198.5 million. It contributed $53.7 million in revenue and $7.0 million in net income during the quarter. June 1, 2018 brought the acquisition of athletic and performance-based lifestyle footwear brand Icon-Altra for $131.7 million. During the recent quarter its revenue and net income contributions were $17.0 and $1.9 million respectively. On April 30, 2018, VF sold the Nautica brand for $289.1 million and recorded a loss of $38.6 million. VF sold its License Sports Group and the JanSport brand collegiate businesses on April 28, 2017, receiving net proceeds of $213.5 million and reporting a loss of $4.1 million. And in October 2018 VF sold Reef. Finally, after all my years bemoaning that we got no indication of how Reef was doing, we get a few numbers as a going away present. Subject to some adjustments, the proceeds from the sale were $139.4 million. The expected loss $9.9 million. Reef’s revenues, we’re told in the conference call were around $150 million annually. They’ve also sold the Van Moer business they got with Williamson-Dickie, but the numbers are very small. VF has always characterized itself as a portfolio manager. I hypothesize that VF has stood up, sniffed and wind, and taken notice of the massive changes happening in brand and retail management. No kidding, right? Haven’t we all. Many retailers and brands, however, seem flummoxed bordering on paralyzed by the change. Or it’s just too late for them. VF, on the contrary has looked at it’s size, it’s diversified portfolio, management discipline and processes, manufacturing and supply chain flexibility, solid financial condition and strength as a portfolio manager and seen an opportunity rather than a problem. Over the years, we’ve watched lots of brand try and fail at extending their brand franchise into other distribution and new customer groups. This has been especially prevalent in public companies because of the pressure to increase revenues. VF is very specifically restructuring its portfolio of brands to take advantage of the new competitive conditions in ways it believes many of its competitors can’t or won’t. Brands they acquire (and keep) will have the virtues they describe in talking about Vans, The North Face and Williamson-Dickie in the quotes above and will be positioned to benefit from the resources VF brings to the table. The jeans business they are spinning off is an excellent example of a business that doesn’t fit VF’s criteria. Think about that while we move on to the numbers for the quarter. Revenues as reported rose 15.2% from $3.39 billion in last year’s quarter to $3.91 billion in this year’s. The breakdown by channel and segment is shows below for this year’s and last year’s quarter. Outdoor includes The North Face, Timberland, Smartwool, Icebreaker and Altra. The big dog in the Active segment is Vans. It also includes six smaller brands. Of those six, JanSport and Reef are now sold. Remember that Jeans is being spun off. 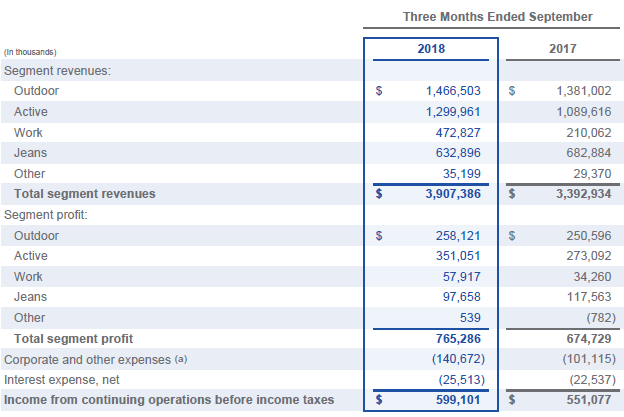 The next chart shows revenue and operating profit by revenue by segment for the two quarters. It’s a little easier to compare the change in revenues than in the chart above. Of the revenue growth of $515 million quarter over quarter $230.9 million was from organic growth and $323.5 million from acquisitions. Vans revenues rose 26% and The North Face 5%. Timberland revenue fell by 2%. Wrangler and Lee were down 5% and 9% respectively, in case anybody was wondering why they are being spun off. Operating income grew 14.4% from $575.5 to 658.7 million. Net income rose 31.4% from $386.1 to $507.1 million. The balance sheet remains strong with no significant changes not explained by acquisitions and divestitures. Cash provided by operating activities fell from $217 to $103 million. We went through a phase years (decades?) ago where I pronounced, correctly I think, that operating well was a competitive advantage because so few were doing it. As industry management sophistication increased (more or less) I decided that operating well had become just a requirement of getting a chance to compete offering no competitive advantage- companies that had survived were mostly operating well. Now VF, as well as a few other companies, believes they can make operating well- keeping up with a relentless pace of change- a competitive advantage again. For its September 30 quarter, 436 store Big 5 reported a small decline in revenue and a larger decline in net income. More significant to me are comments in the conference call that suggest a very traditional retail focus, rather than one acknowledging the massive changes required to succeed at retail. “Sales from e-commerce in the third quarter of fiscal 2018 and 2017 were not material and had an insignificant effect on the percentage change in same store sales for the periods reported.” You might also want to look at their web site. It’s 2018 and a 436-store retailer has e-commerce revenues that are “not material?” Hmmmm. Wonder how much e-commerce related expense it takes to produce “not material” revenues. Finally, there was 0.10 decline in merchandise margins. SG&A expense rose a couple of hundred thousand to $77.7 million. As a percent of revenue, they rose from 28.6% in last year’s quarter to 29.2% in this year’s. Minimum wage increases, especially in California where more than half of their stores are located, caused a $400,000 increase with more coming. Operating income was down 52.7% from $10.2 to $4.8 million. Interest expense rose from $447,000 to $860,000 reflecting both higher debt levels and an interest rate that rose 1%. That’s happening to many companies. Income taxes fell from $3.79 million to $844,000 “…primarily reflecting a reduction in the federal corporate income tax rate…” The decline in net income was 47.7% from $5.95 million in last year’s quarter to $3.12 million in this year. Consider how much more net income would have fallen if not for the reduced income taxes. Net cash used in operations for the six months ended September 30 was $8.06 million, up from $5.55 million in the same six months last year. You’d rather see cash generated by operations rather than used. On the balance sheet cash, at $5 million is down about $300,000 from a year ago. Inventory has risen from $309.3 to $314.8 million. They note they are carrying over some inventory to next year- a common practice these days (but also indicative of a lack of product differentiation in the industry). The current ratio has improved from 2.07 to 2.36 times. Long term debt is up from $46.4 million a year ago to $83.5 million at the end of this year’s quarter. Equity has fallen by 11.3% from $203 to $181 million. The quarterly dividend has been reduced from $0.15 to $0.05, reflecting the weaker financial position and operating results. Collecting, slicing and dicing, and making better use of customer data is something every retailer has to be figuring out how to do better. They also are increasing their digital advertising spend at the expense of newspaper advertising. But other comments seem traditional. There’s a generic statement about the change happening in retail, but what I hear in their comments is a tactical urgency to deal with the current financial situation (not inappropriate) rather than a strategic acknowledgement that a lot has to change- quickly. “We are testing pricing strategies to be more responsive to an increasingly promotional competitive retail environment.” He mentions that again in part of his response to an analyst’s question. Well, okay, but if you’re planning to compete on price with brands lots of others carry with your current real estate model in an environment of over supply and limited product differentiation, you might have a hard time. No brick and mortar pricing strategy is likely to win in an online world unless the product offerings are distinctive in ways that probably have to go beyond the actual product attributes. Again, fine, but tactical. Have you acknowledged the fact that brands are going to turn over faster? How are you identifying and bringing in new brands and what’s the process for getting them in the right stores? How’s the micro sorting going? There are a couple of mentions of finding new ways to reduce expenses. That’s great, but of course there’s a limit to it and as they describe it, it sounds tactical. Successful retailers won’t be the ones that reduce expenses; they will be the ones that increase expenses in a way that improves margins, provides a better customer experience, and ties brick and mortar and online together in a way that ultimately reduces costs. It’s hard to know too much about what’s going on from what they say in a conference call, but I work with what they give me. I suggest you visit a Big 5 store then perhaps a Dicks and see what you think. I’d like to see more sense of urgency from Big 5. An acknowledgement of the interdependence of brick and mortar and online as a means of providing customers with the flexibility and connection they require would make me feel a whole lot better too. Serendipitously, I hear this is also the last season of the TV show “The Walking Dead.” But while I expect that TV franchise to continue in some form, the same can’t be said for Sears. I know it’s supposed to be a restructuring, but no amount of financial engineering can compensate for Sears’ lack of customers and a defendable and identifiable market position- especially after the most valuable assets have been stripped. You might read this excellent article on Wolf Street to understand how Sears got to where it is- at least from a financial perspective- and why it’s prospects are grim. What could have Sears have done differently? Human behavior being what it is, probably nothing. In a perfect world, management would have recognized 20 years ago some of the changes that were coming. That’s expecting too much. By the time they figured out where things were heading, it might have been too late. And as you will recognize if you read the article linked to above, the interests of the CEO and hedge fund owner who controls some of Sears’ prime assets and is a secured creditor were not exactly aligned. In our industry we’ve watched some public companies get into trouble, I’ve argued, specifically because they were public and simply could not do, as public companies, what they needed to do. Neither Quiksilver or Skullcandy, to use a couple of examples, had a strategy that was consistent with building their brands in the changing retail market and meeting the requirements of being public. They ended up in private hands- exactly what should have happened and where the brands have the best chance to succeed. There’s no public data, of course, on how Skullcandy, Quiksilver, Roxy or DC Shoes are doing. But at least now they can focus on branding and distribution in a way appropriate to how they need to compete. They couldn’t (didn’t) do that when Wall Street was requiring regular, significant revenue growth. Sears should have gone private too. Not in the form of hundreds of big stores in malls selling everything. That ship has probably sailed due to online/Amazon/millennial habits/demographics/etc. What would have happened if somebody at Sears had had the vision to say, “We need to do something risky, dramatic and different if we’re going to be a viable business? JC Penney tried that. They brought in Ron Johnson from Apple to completely remake the brand. As you may recall, that didn’t work. Neither Mr. Johnson or the Board of Directors or Penney’s balance sheet had the patience or the ability to withstand the pressure his aggressive new strategy generated. I’d argue that it would not have worked even if they’d had the patience, as JC Penney has the same problem Sears has; too many stores that are too big selling too much commodity like stuff. Sears had some valuable brands. These include Diehard, Lands End, Kenmore, Craftsman. Am I forgetting any? Yeah, I know. If that person is out there, you’d like to meet them, hire them, work for them. Me too. That visionary might have suggested that each of Diehard (a battery brand but let’s think of it as auto repair), Lands End, Kenmore, Craftsman, perhaps others each had potential to find life as companies/brands independent of the Sears name. The challenges of the new consumer and retail market would still have existed but starting with a strong brand is a leg up. Vans comes to mind. It was a $400 million public company in trouble when VF bought it. Let’s say that with the full support of the board of directors and the stock market, Sears spins off these brands and closes the rest of Sears. Didn’t I just make that sound easy? Here in the highly inconvenient real world there would be shareholders, a board of directors, all the real estate people who have long term leases with Sears, debtholders who have some of those assets as collateral- well, you get the picture. The bottom line is it can only happen though a bankruptcy filing where shareholders lose everything, unsecured creditors lose most of what they are owed, store leases can be rejected, and a deal can be made with the secured creditors. Basically, bankruptcy is a legal process for allocating losses when the assets are no longer worth what people paid for them. You also must hope that the brands being spun off, either as separate public companies or sold to private equity, haven’t been so damaged by corporate attempts to generate cash flow at any cost that they have lost their cache. Can you think of any brands in our industry that applies to? The lesson here is about the dynamics of change. You need to act sooner rather than later but the realization of the need to do something different often doesn’t happen soon enough and the resistance to doing it is extreme until outside stakeholders force action. Back on September 11, due to some speculation in the media, Amer Sports confirmed that it had “…received a non-binding preliminary indication of interest…from a consortium comprising ANTA Sports Products Limited and the Asian private equity firm FountainVest Partners…” to buy all of Amer Sports’ shares at a cash price of forty Euros per share. Here’s a link to the Amer Sports web site. The brands the company owns include, among others, Salomon, Arc’teryx, Armada and Atomic. The ANTA web site can be found here. They are a public Chinese company with reported 2017 revenue of 16.7 billion renminbi (about US$ 2.4 billion at the current exchange rate). And here is their web site if you want more information. On October 11 Amer Sports, by press release, confirmed that there have been discussions between Amer Sports and the potential buyer “…to ascertain whether there is a basis to commence a more formal process to facilitate a possible recommended transaction.” You can find the press releases here if you’re interested. We are a long way from a deal, but they’re talking. As of the end of June, Amer Sports had 116,517,285 shares outstanding. The stock price closed at 33.89 Euros on October 12. A purchase price of 40 Euros would represent a premium of 18% and an enterprises value of 4.66 billion Euros. The stock price has risen from around 29 Euros since the September 11 announcement, with most of the increase coming at the time of the announcement. It will get closer to 40 Euros if the market comes to believes a deal is more likely to happen. A quick look at ANTA’s balance sheet leads me to believe they don’t have the financial capacity to pull off the deal alone, hence the involvement of FountainVest. I don’t have any staggering insights on this transaction, but I hadn’t seen it mentioned and thought you’d be interested in knowing about it. We are in an industry where it’s good to be big.